15. Vinyl moldings, flat-painted surfaces, etc. 16. Tires, interior panels, etc. 1) Just exactly what is WET PAINT Automotive Polishing Glaze? Actually, it may be easier to explain the reverse. First of all, Wet Paint is NOT a wax because it contains no waxes. Neither is it solely a polish; it is capable of performing far too many miracles to fit neatly into that category. And finally, it bares little resemblance to expensive paint sealants, as youll see in the following paragraph. Before we zero in on a precise definition of Wet Paint, however, lets take a brief look at other car care products in general. Of the three product classifications just mentioned, waxes do a great job of protecting a vehicles finish, but have limited abilities when it comes to revitalizing neglected paint. Polishes are great at removing minor stains and blemishes, and are much more capable of rejuvenating dull paint than waxes; but they can be overly abrasive in the long haul, and leave very little behind in the way of long-term protection. And then there are paint sealants, which offer a great shine and long-lasting protection but are totally incapable of cleaning or polishing. A cars finish must be in pristine condition before they can even be applied. It helps, too, to carry a platinum credit card with you when considering this type of product. Wet Painton the other handcleans, shines and protects all in one step, thus combining the best attributes of waxes, polishes and paint sealants without any of the drawbacks. 2) Should Wet Paint be used in conjunction with any of the previously mentioned products? No. There is simply no point in doing so. However, Wet Paint may certainly be used instead of waxes, polishes and paint sealants or over existing waxes, polishes and paint sealants. The only time a combination of products makes good sense is when Wet Paint is used as a protective coating over a vehicle thats already been deep cleaned with a heavy-duty rubbing compound. 3) Why is it possible to use Wet Paint on a dirty surface? Wet Paint is loaded with ingredients35 in allway more than products made by other manufacturers. Among its many ingredients are detergents, wetting agents, lubricants and sealing compounds, many of which have never been used by the car care industry. Without the lubricants, for example Wet Paint could not be applied to a dusty or dirty surface without leaving scratches. Certain other compounds make Wet Paint amazingly easy to buff clean. Still others add depth and wetness to the surface. And on and on it goes. In summary, the detergents and wetting agents in Wet Paint combine to soften surface grime, while a special blend of polymeroxane fluids and hydrophenolic lubricants attaches a microscopic layer of LumiShield-41 to the surface. LumiShield-41 (a name coined by us) is an extremely rare and expensive substance that provides a bonded layer of protection against abrasives not already broken down by the detergents and wetting agents. Thereafter, the chemically treated dirt particles remain in a state of suspension until they are collected in the porous fibers of a terry cloth towel. It is extremely important that a Wet Paint AIRosol sprayer be used to apply the material, and that it be rubbed into the surface with a soft, clean terry cloth towel. 4) What happens if Wet Paint freezes? Nothing. Repeated cold-cycle tests at -20° F. have validated the thermal stability of Wet Paint. The containers themselves, however, become quite brittle when subjected to sub-freezing temperatures and may easily burst because of product expansion. For this reason, it is advisable to store Wet Paint at room temperature, out of the reach of children. 5) Why does Wet Paint have to be shaken vigorously before each use? Mainly, to remix several of the ingredients that readily fall out of solution. It is critically important that the AIRosol sprayer be inverted (turned upside-down) and shaken vigorously for 15-20 seconds prior to use. This will also prevent spray valves from clogging, which is likely to happen if the bottle sits idle for an extended period of time. If the AIRosol spray valve does clogeven after shaking the bottle thoroughlyturn the bottle upside-down and depress the spray valve for 2-3 seconds to expel air only. Then, pump additional air into the bottle (at least 10 strokes) and retry. Repeat this procedure two or three times, if necessary. It is important to note that this anti-clogging procedure is 100% effective. 6) Can another type of spray bottle be used? Possibly, but at the risk of nullifying warranty protection. Furthermore, we have found trigger-sprayers and finger-pump sprayers to be very inefficient when compared to Wet Paints AIRosol sprayernot to mention quite intolerant of Wet Paints powerful roster of ingredients. If another type of sprayer is used, make sure that its totally free of contaminates or residue before filling with Wet Paint. 7) What will happen if I polish over wet areas on my car? It is quite permissible to use Wet Paint on wet surfaces, provided they arent too wet. A "too wet" vehicle is one that has been heavily rained upon or is beading copious amounts of water due to previous Wet Paint applications. The horizontal surfaces on the vehicle may simply contain too much water for that to be practical. If the vehicle is not excessively wet, however, simply apply Wet Paint more liberally than normal; then, rub it into the finish until it produces the same hazy film associated with dry vehicle polishing. All other bottle directions remain the same. Note, too, that the vehicle may be both wet AND dirty. 8) Speaking of polishing over dirt, how dirty is TOO DIRTY? Mud, clay, heavy salt spray, tar, bugs and tree sap are examples of things that CANNOT or SHOULD NOT be polished with Wet Paint. Let common sense be your guide. If in doubt, by all means wash the vehicle firstor, in the case of road tarremove it with an appropriate solvent. 9) How strong is the Wet Paint warranty in regard to scratched or damaged paint? Our warranty basically states that because were unable to stand over a customers shoulder as hes polishing his vehicle, making certain that each of our bottle directions is being followed to the letter, its virtually impossible to determine whether a damage claim is legitimate or not. Consequently, it will be necessary for the customer to prove that Wet Paint damaged his vehicle. That is going to be very difficult inasmuch as NO problems have ever been encountered during the millions of field tests our customers have given Wet Paint since its introduction in 1988.
it should spray properly. And once a vehicle is polished, it should shine more than it did previously and be capable of beading water. If there are problems with any of the above items, the bottle should be returned to the selling dealer for a full refund or replacement. 10) How durable is Wet Paint? a surface that is constantly being scrubbed by wiper blades, ice scrapers, bug sponges, etc. If applied to the paint on a new vehicle, then reapplied on a periodic basissay, twice a yearthe paint on that vehicle should show remarkable resistance to fading. If applied to older, extremely oxidized paint, the need for reapplication may come every 2-4 months, even though the paint may still be beading water like crazy. Once the oxidation process begins, it cannot be stoppedit can only be slowed down. Thats why periodic protection is critically important, especially in areas that suffer from high sun exposure, acid rain or road salts. Inhabitants of coastal areas, too, need the extra help that Wet Paint can give them. 11) Can it be harmful to use Wet Paint too often? Not at all. 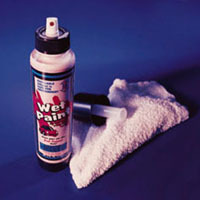 Wet Paint may be applied daily without harming painted surfaces. Wet Paint only works as hard as it needs to. If the paint is in excellent condition, it will be as gentle to the finish as water. If the paint is oxidized, it will remove all of the oxidation without removing any of the good paint below. 12) What is "cold shock"? If youve ever used an aerosol spray-paint to paint a large object, you may have experienced "cold shock" without realizing it actually had a name. The propellants inside the container cause the can to become icy-cold after periods of continuous spraying. Of course, this can never happen with Wet Paint because the bottle is pressurized with ordinary air. 13) What is the life expectancy of the spray bottle? The answer to that question varies with the degree of care given each bottle; however, with proper treatment they should last a very long time. Possibly forever! Believe it or not, each bottle is hand-tested before leaving the factory in order to prevent manufacturing gremlins from entering the picture. More importantly, each bottle is warranted to be in perfect working order at the time of purchase. Once placed in service, the AIRosol should not be dropped because any sudden impact can easily damage the spray valve. Worse yet, the impact itself may cause a fully pressurized bottle to burst! One of the common mistakes people often make is that they set the AIRosol atop the car they’re polishing. If the surface has already been treated with Wet Paint, the bottle is almost certain to slide off and crash to the ground! Once the polish job has been completed, tip the bottle upside-down and depress the button on the spray valve until all internal air has been discharged. Then, store the bottle indoors, out of the reach of children. It is also critically important that you store the bottle in an upright position. If laid on its side, sediment may eventually clog the internal spray mechanism. 14) Should Wet Paint be applied to vinyl tops? No. While Wet Paint will not damage vinyl roofs, problems may arise when trying to remove Wet Paint residue from the deeply grained material. The simple rule is: Wet Paint should only be applied to hard, non-porous surfaces. 15) How about vinyl moldings? Its almost impossible to polish a car without getting some of the Wet Paint material on vinyl body moldings, rubber bumper fascias, flat-painted outside mirrors, doorframe moldings or windshield wiper arms. Fortunately, Wet Paint will not leave heavy polish residue on these types of surfaces, unlike many other polishes and waxes. It will be necessary, however, to buff each of these items before theyve had chance to dry. 16) How about vinyl or leather door trim panels, padded instrument panels, tires, etc.? Again, the answer is "No." In fact, extra care should be taken when polishing the inside of a windshield to prevent spray from drifting into inaccessible areas. Moreover, this is the only instance in which its permissible to spray Wet Paint directly on the application towel before applying the product to the surface. If Wet Paint droplets land on the sidewall of a tire while polishing a wheel or hubcap, simply wipe the tire dry with a separate towel. (Paper towels are more than adequate). 17) Ive noticed that some of the Wet Paint sprinkles get past door, trunk and hood openingseven gas filler doors. Is it harmful to leave them there for a long period of time? 18) What type of buffer should be used when "machine polishing"? Ideally, a variable-speed rotary style unit is the perfect choice, either electric or air-driven. However, the type of buffer one uses is of less importance than the type of bonnet attached to the buffer, as the next two paragraphs illustrate. With older vehicles, a lamb’s wool bonnet is the “weapon of choice” due to its ability to remove the most oxidation in the least amount of time. Moreover, it’s virtually impossible to create swirl marks or generate buffer burn, thanks to the super slippery nature of Wet Paint. With newer vehicles, however—generally those manufactured after the year 1990—we recommend the use of microfiber or terrycloth bonnets. That’s because modern paint finishes, which are protected with a layer of clear paint, are less likely to oxidize or turn ‘chalky’ than their older brethren, yet are more likely to show scratches, blotches, streaks, etc. Because the top layer of paint is clear, light reflects through the transparent coating and bounces back to the eye, hi-lighting [from behind] any flaws that may be present. As a result, clearcoating tends to magnify most defects, making them appear worse than they actually are. Since it’s only necessary to add gloss to the clearcoat rather than buff through layers of oxidized or faded paint (as was the case in the past), using too aggressive a buffing pad only makes matters worse. This is why we recommend microfiber or terry cloth bonnets. Foam pads provide yet another alternative, although they are generally less effective than either microfiber or terrycloth. 19) What buffer speeds work best? 1000 -1500 RPM is ideal, but speeds up to 2500 RPM are acceptable as long as the buffer is kept in constant motion. The reason lower speeds are advisable is because the pad will ‘bite’ into paint better, just as a slow-spinning drill bit will cut into metal more effectively. In addition, a wildly spinning wheel is more likely to raise havoc with hood ornaments, radio antennas, vehicle badges, lettering and so forth. The main thing to remember is to let the pad do the work. Understand, too, that in certain instances it may be better to position the pad at a slight angle to the surface, while at other times it works better to hold it flat against the surface. In either case, operate the buffer using unhurried, overlapping, circular motions while maintaining slight downward pressure. If the weight of the buffer is sufficient enough, additional downward pressure may not be needed. 20) Is it really impossible to ‘burn’ paint with a power buffer when using Wet Paint? Nothing is impossible, but you’ll have to try awfully hard—like running a wool pad over a sharp hood crease for 30 seconds at 3,000 RPM! If one uses the proper pad though—wool for older cars / microfiber or terrycloth for newer cars—it just can’t happen because the surface becomes too smooth & slippery to generate enough friction. Less friction means less heat, and less heat means no buffer burn. 21) Can Wet Paint remove rows of swirls left by previously applied cleaners or rubbing compounds? Yes, provided you buff in a direction perpendicular to the original pattern, or in overlapping, circular motions. 22) When polishing a vehicle, how heavy should the spray be? "More" is not necessarily "better" unless the vehicle is fairly dirty. Spray with long, sweeping motions, holding the bottle approximately 12" from the surface. 23) Should anything other than a terry cloth towel be used when applying Wet Paint by hand? Terry cloth towels are an absolute must! DO NOT use materials such as old cotton T-shirts, flannel, cheesecloth, polishing pads or damp sponges. They simply do not work with Wet Paint. The only exception to the terry cloth rule is the new microfiber towel that has taken the industry by storm. Even then, the towels must be the soft, deep-pile type that look & act similar to terry cloth. Made of 80% Polyester / 20% Polyamide, this synthetic blend is actually softer than cotton and contains more than 90,000 fibers per square inch! The net result is a towel capable of removing polish residue quickly and completely. Benefits such as these will be especially noticeable when polishing darker colored vehicles. If you’ve ever encountered problems with ‘streaking’, microfiber towels are definitely the answer. Just make sure the towels you use are thick & plush because a thin microfiber towel will not perform as well as ordinary terry cloth towel. 24) How large should the buffing towels be, and can they be reused? A towel the size of an ordinary "hand towel" is ideal. We’re not talking beach towels or wash cloths, we’re talking the in-between size that’s approximately 14" x 16". (Think "Mama Bear".) The good news is that terry cloth towels can be found in virtually every home. It doesn’t matter if they’re old and frayed as long as the nap is of sufficient depth. If robbing the family laundry bin is not a viable option, bundles of inexpensive terry cloth polishing towels can be purchased at many retail outlets and auto parts stores. Cost-wise they’re a terrific bargain because they last practically forever and can be rewashed endlessly. In fact, the more often they’re washed, the better they perform. As for microfiber towels, if you can’t find them locally, they’re readily available online. Laundry tips: Accumulate dirty towels until you can justify washing them all at once in a washing machine. Afterwards, they should be dried in a clothes dryer. Air-drying is not advisable because the towels will become stiff and scratchy…the last thing you need when polishing a delicate surface. Ideally, even new towels should be "machine washed & dried" before placing them in service. The use of a fabric-softener is also recommended, except in the case of microfiber towels. 25) Can I spray Wet Paint directly onto a towel before rubbing it into the paint? No! In addition to being grossly inefficient, doing so will likely lead to scratched paint and will certainly lead to a voided warranty. The only time this is permissible is when applying Wet Paint to the inside of a windshield in order to prevent polish sprinkles from drifting into inaccessible areas. 26) After rubbing Wet Paint into a surface, should it be toweled-off while damp, or allowed to dry completely? Normally, it makes no differencebut for maximum productivity, its best to apply Wet Paint to the entire vehicle (including glass, chrome, etc.) before buffing it clean with the second towel. That way, youre not constantly swapping towels, or respraying areas youve already gone over. However, in cases where the paint is in very poor condition (dry, rough, oxidized, etc. ), it may be advantageous to remove the polish immediately before moving to the next area. In such instances, it may also be desirable to apply a second or third coat before continuing to the next section. 27) How many polish jobs can I expect from a single bottle of Wet Paint? Using a brand new, compact car as an illustration, an 8-oz. AIRosol should yield up to four complete polish jobs. Accordingly, a 32-oz. REFILL should provide approximately sixteen applications. Of course, logic dictates that the larger the vehicle, or the worse the condition of the paint, the more polish youre going to use. 28) You’ve already mentioned how durable Wet Paint is in regard to ‘protection’, but how often should I polish my car in order to keep it looking really good? There are an awful lot of variables here: The age of the car, condition of the paint, color of the paint, whether or not the car is garaged, climate and road conditions, frequency of washing, etc. At a bare minimum, we’d like to see everyone treat their vehicle to Wet Paint at least twice a year to prevent color loss. But to keep it looking REALLY sharp, i.e., to create an incredible sense of depth and wetness while producing a finish that feels more like smooth porcelain than paint will probably require monthly reapplication. In most cases, an application every three to four months will keep a vehicle looking showroom fresh for as long as you own it. Considering how quick and easy Wet Paint is to use—and insomuch as Wet Paint takes the place of a wash-job anyway—you’ll find this a very easy program to follow. 29) Is Wet Paint safe for clearcoats? Totally! Wet Paint has been laboratory tested on every type of paint from ancient lacquers right on through to todays high-strength, high-gloss acrylic urethane and polyurethane paints. Some of our test vehicles have been hand and machine polished as many as 300 times with no visible paint loss or deterioration. When applied in accordance with label directions, Wet Paint is completely safe for use on all hard, non-porous surfaces. 30) How soon can Wet Paint be applied to a newly painted vehicle? The paint industry, as well as the automobile industry, generally advocate waiting anywhere from 30-90 days before waxing a newly painted [or repainted] surface. During this period, thinning solvents evaporate from the paint, allowing it to harden or ‘cure’. Our own experience has shown that 90 days is unnecessarily long due to major advancements in paint technology, the use of chemical hardeners, etc. Consequently, our official position is that one should allow at least 30-days to lapse before Wet Painting a freshly painted vehicle for the first time. 31) Is Wet Paint capable of removing ‘hard water’ spots? Wet Paint is better than most waxes & polishes when it comes to removing hard water spots, but only if they’re relatively ‘fresh’ or haven’t set in too deeply. If repeated applications of Wet Paint (applied by hand while using a microfiber towel) aren’t up to the task, then it may be necessary to address the problem with a more aggressive product. Removing deeply embedded stains—especially from less than perfect paint—would have required the inclusion of heavy-duty abrasives in the Wet Paint formula, much like those found in rubbing compounds. Of course, Wet Paint was never intended to take the place of full-blown rubbing compounds. 32) What benefits are there to using Wet Paint on glass? Are there any special precautions to consider? A more realistic benefit to using Wet Paint on glass is that bugs, bird-droppings, tree sap and the like are much easier to remove thanks to Wet Paint’s armor-like "invisible shield". Snow is easier to brush off during winter months too and wiper blades less likely to freeze in place. But the two greatest rewards for using Wet Paint on glass are the "crystal-clear" nature of the product together with its incredible durability. There are simply no better products to use on glass or mirrors period. And you won’t believe how easy it is to wipe fingerprints or nicotine film from Wet Painted glass, using nothing more than a dry towel. 33) Is it okay to apply Wet Paint under direct sunlight or to a hot surface? Yes and no. If Wet Paint is rubbed-in immediately after spraying, it will perform very well under hot, sunny conditions. The potential problem here is that paint becomes "scratch friendly" when softened by heat. If the paint is malleable enough to form a crease when pressed firmly for a few seconds with a thumbnail, the surface should be allowed to cool before polishing. However, if the vehicle is totally clean to begin with, then soft paint is essentially a non-issue because there’s nothing that can cause a scratch in the first place. Technically speaking, Wet Paint will work at surface temperatures of between 35 and 140 degrees Fahrenheit; however, temperatures ranging between 55 and 90 degrees are considered optimal. Keep in mind that ideal working conditions will always yield the best results; thus, a garage is by far the best polishing venue. If one isn’t available, look for a shaded area outdoors that’s protected from wind. 34) Does Wet Paint provide protection against ultra-violet radiation? Wet Paint contains two special ingredients to help protect against ultra-violet damage; however, one should be aware that nothing can totally protect against something as powerful as the sun. Just as sunscreen cannot forever prevent ones skin from burning, UV blockers cannot forever protect painted surfaces from sun-fade. Reapplying Wet Paint on a periodic basis will replenish the oils needed to prevent paint from drying out. 35) How good is Wet Paint at removing scratches? Surprisingly good, considering the low viscosity of the product. Of course, no product can actually ‘remove’ a scratch. Some products simply fill scratch voids with material of a similar color, while others smooth the edges on each side of the scratch to make it less noticeable. Wet Paint is of the latter variety. For minor scratches, two or three vigorous applications of Wet Paint with a microfiber towel are generally sufficient. If the scratch is still noticeable afterwards, a power buffer can eliminate most of what’s left. When power buffing, spray Wet Paint directly over the scratched area, allowing the spray to cover an area slightly larger than the buffing bonnet. Next, place a 1500-RPM buffer equipped with a microfiber or terrycloth bonnet directly against the scratched surface and turn it on. Hold the buffer in position for 20 seconds before feathering the pad into surrounding areas. Repeat once or twice if necessary. Really deep scratches may require some combination of the following: touch-up paint, clay bar, rubbing compound, Wet Paint. Frankly, this is a job that’s best left to the professional. 36) From a health and safety standpoint, how does Wet Paint rate? For a full technical evaluation of Wet Paint, click here or visit the MSDS page located elsewhere on this site. In broad terms, Wet Paint is a relatively safe product when handled appropriately. Unfortunately, almost any chemical product can be of some risk under the right circumstances. For that reason, certain precautions must be acknowledged and observed at all times. For example, certain hypersensitive individuals may experience an allergic reaction to the petroleum-based solvents included in the Wet Paint formula. This may result in skin irritation from handling polish-laden towels, or dizziness, headache, eye irritation, anxiety, and/or respiratory distress from breathing vapors given off by the aerosol spray. A pair of thin latex gloves will provide total protection against skin irritants, and the aftereffect of airborne vapors can be eliminated or reduced substantially either by increasing the flow of ventilation within a closed area, wearing a mask or respirator, or by polishing a vehicle outdoors. In addition, there are three situations that one must always avoid: (1) DO NOT spray Wet Paint on or near an open flame; (2) DO NOT spray Wet Paint on a hot engine or exhaust system; (3) DO NOT spray Wet Paint on any item capable of producing a spark. Although the Wet Paint liquid itself is totally incapable of supporting combustion, there is a very slight risk that lingering vapors may ignite under the conditions described above. Regardless of the degree of risk, it is always better to error on the side of safety. Finally, one must be careful not to drop a pressurized AIRosol container onto a hard surface as it may burst with significant force. When finished with the AIRosol sprayer, we advise tipping the bottle upside-down and depressing the spray valve button until the bottle’s internal pressure equals barometric pressure. That is to say, until the bottle stops discharging air. By blowing compressed air through the valve, you’re also reducing the likelihood of future clogging problems. 37) What is the shelf life of Wet Paint? For all intents and purposes, the shelf life of Wet Paint is limitless. Over time, Wet Paint will gradually lose its pink color and fruity fragrance, but that’s about it. Of course, after years of sitting unused, the bottle will require a great deal of shaking in order to loosen sediment from the bottom of the bottle. 38) Can Wet Paint be used on window tint? We don’t recommend doing so and CANNOT warrant damage that occurs as a result. Please follow the manufacturer’s recommendations when cleaning any adhesive type product, whether it be window tint, decals applied directly to paint, or whatever. Do you have questions about Wet Paint? Please Contact Us.